It's Helen, did you miss me? It has been a while since I shared a post here but today I want to share my thoughts on one of my favorite products. 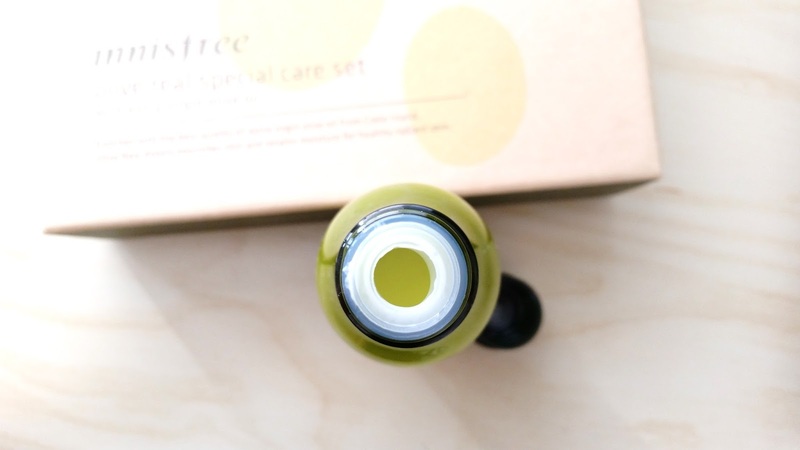 It is the Innisfree Olive Real Lotion. This was one of my first olive skin care products, so I did not know if I was going to like it or not. However, it became a favorite of mine after I tested it out for a couple of weeks. 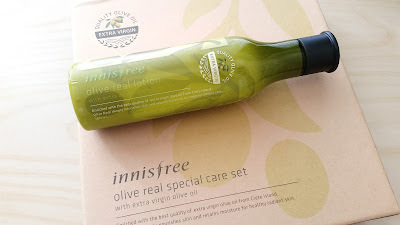 The Olive Real Lotion is from Innisfree's Olive Real line, which is one of Innisfree's 8 solution lines. 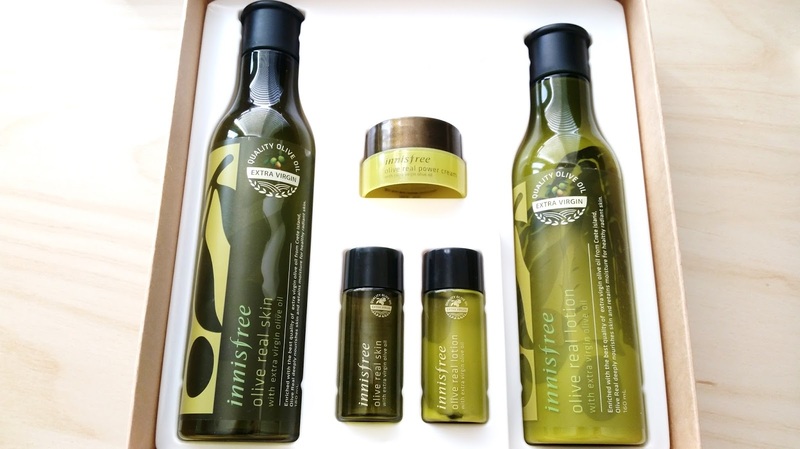 The Golden olives Innisfree uses promises to provide 24 hours of hydrating care that will keep the skin looking radiant. I got the Innisfree Olive Real Lotion in a set from my daughter for mother's day last year. I'm almost finish with this lotion, so (*ahem* hint *ahem*) maybe my daughter will surprise me again. Product Description: A deeply moisturizing lotion that provides hydration and nutrition to the skin. The lotion is formulated with organic olive extract, which is full of antioxidants and vitamins. Together with other extracts and oils, the lotion works to soothe the skin while providing long lasting moisture to it. The lotion will also provide 24-hour hydrating care. To Use: Apply the lotion after the toner. 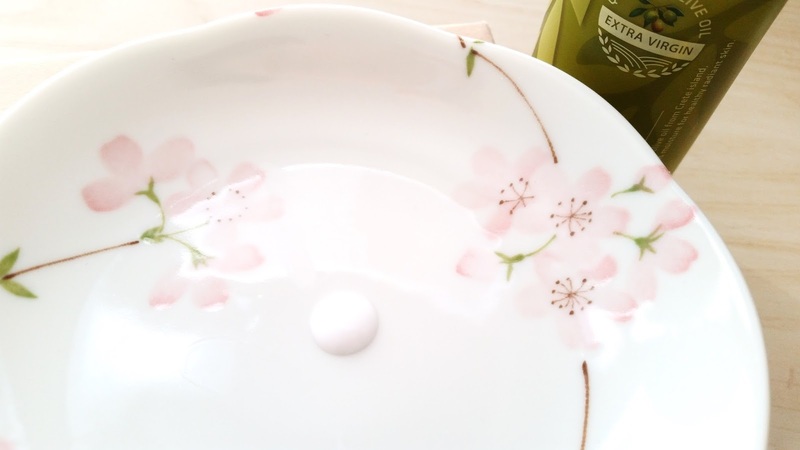 Take a good amount and apply evenly onto the face and neck. Ingredients: WATER, BUTYLENE GLYCOL, PROPANEDIOL, PENTAERYTHRITYL TETRAETHYLHEXANOATE, HYDROGENATED POLYISOBUTENE, HYDROGENATED POLY(C6-14OLEFIN), PENTAERYTHRITYL TETRAISOSTEARATE, GLYCERIN, CYCLOPENTASILOXANE, CAMELLIA SINENSIS LEAF EXTRACT, PEG-40 STEARATE, OLEA EUROPAEA (OLIVE) FRUIT OIL, BETA-GLUCAN, ALLANTOIN, CAMELLIA JAPONICA LEAF EXTRACT, ORCHID EXTRACT, OPUNTIA COCCINELLIFERA FRUIT EXTRACT, CITRUS UNSHIU PEEL EXTRACT, CETEARYL ALCOHOL, DIMETHICONOL, DIMETHICONE, GLYCERYL STEARATE, HYDROGENATED VEGETABLE OIL, STEARIC ACID, PEG-100 STEARATE, SORBITAN STEARATE, CARBOMER, XANTHAN GUM, STEARYL BEHENATE, POLYGLYCERYL-3 METHYLGLUCOSE DISTEARATE, HYDROXYPROPYL BISPALMITAMIDE MEA, INULIN LAURYL CARBAMATE, POLYSORBATE 20, ETHYLHEXYLGLYCERIN, DISODIUM EDTA, TRIETHANOLAMINE, PHENOXYETHANOL, CITRUS AURANTIUM DULCIS (ORANGE) PEEL OIL, CITRUS MEDICA LIMONUM (LEMON) PEEL OIL. Packaging: The bottle and box has that simple and eco-friendly packaging. The box is printed with soy ink and the containers are made with recyclable materials. 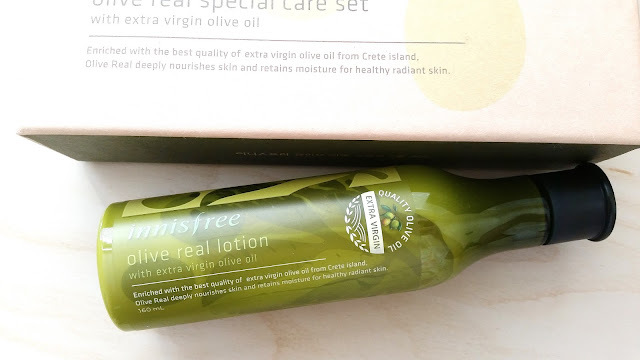 The ingredient list and information of each product can be found on the back of the box or on Innisfree's global website. The bottle has a fairly wide opening, so the lotion can come out easily. It also comes with a white plastic stopper as well. Scent: The Olive Real Lotion has a refreshing olive scent. It does not smell like extra virgin olive oil, but more of a fruity olive scent. The scent is light and pleasant. Color: The lotion is milky in color. Texture: The lotion is runny and light. It absorbs easily. The bottle has a wide-ish opening. It also comes with a white plastic stopper (not pictured). My Thoughts: I like olives and I have normal to dry skin type, so my daughter got me this moisturizing set in hopes that I would like it. At first, I was not sure if I would like it or not. However, that changed when I started to test it. I got the lotion in a set with the toner and mini samples of the toner, lotion and cream. I use the skin (toner) and lotion together. My skin was so soft after each use, I was amazed. The lotion soothes my skin when I apply it and it leaves my skin feeling moisturized. The hydrating care really does last a long time. Although I would not say if it really lasts 24 hours or not because I have not test it for that long. It does last 12 hours though, which is pretty good already. I have been using this duo (Olive Real toner and lotion) and masks for over 8 months now and the result is really nice. My skin looks more radiant, it feels softer and plumper. My makeup sits better on my skin and I do not have to worry about dry patches anymore. Personally, I like the scent of this lotion. I find it pleasant and light. I thought it was going to smell like extra virgin olive oil at first because the bottle and the box has that big circle symbol of it. However, it has a fruity olive scent instead. It is nice, I like it. The texture of this lotion is really light. It absorbs easily and does not leave behind any sticky residues. Despite the lotion's light texture, it provides a good amount of moisture and hydration. If needed, I can also layer on a cream or a sleeping pack afterwards. A few drops of the lotion. Final Thoughts: I really, really love this lotion. I want to stock up on it so I would never run out of it. I think this lotion is great for people who needs a hydration boost in their skin. The nourishing and moisturizing care this lotion provides is really nice and the lotion feels soothing when applied. Would I purchase this in the future? I think so. If I do not find anything better, I would probably keep coming back to it. Do I think this is worth a try? Yes. The Innisfree Olive Real Lotion provides some amazing skin care effects that's worth a try. Plus, it isn't expensive and you can get it in a set for even cheaper! 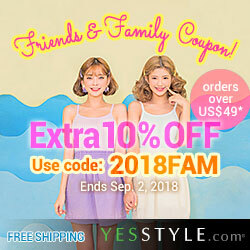 Don't forget to check out our discount and codes page to save when you shop!